Bridal Shower Poems.. 10 printable poems to celebrate the FIRSTS in the couples marriage that can be used as a Bridal Shower gift or game! So easy, just print these attractively formatted poems, attach to the wine or champagne and place in a big basket! Printable Bridal Shower Poem Pack.. This set of bridal shower poems is a perfect addition to any shower. We make it so easy...each poem is attractively formatted. All you have to do is print and tie on with a ribbon to the wine or champagne! 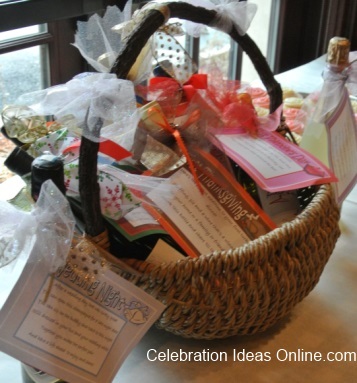 What a time saver when you are busy with all the other bridal shower details! The poems celebrate the FIRSTS of the couples marriage. This pack contains 10 fun and funny poems illustrated with cute and colorful graphics. All you need to do is print them in color on card stock, cut them apart, punch a hole in the corner and then tie the poem around the appropriate wine or champagne noted in the poem with ribbon and add a bow! Place all the bottles in a basket. With an attractive presentation it can also be the focal point of the gifts table or a pretty centerpiece for the main table! Prior to opening the gifts, let the bridal party each take a bottle and read the poem aloud to the guests as they present it to the bride. So, these bridal shower poems can be your entertainment too. In the file, you will find these 10 poems: Wedding Night ; First Anniversary; First Fight; First Valentines Day; First Thanksgiving; First Dinner Party; First Christmas Eve; First New Year’s Eve; First Baby; Tenth Anniversary The whole package is only $4.99.